These were the last of them, at the top of the tree – well, at least at the top of the ladder. They were sweet, after hanging onto that tree, and sipping up every bit of sweetness and sunshine throughout the winter… They were also a deep orange, so much so that I found it hard to believe that they were ever green… We picked and ate quite a few in between, thinking each time that this was as big – and as orange – and as sweet – as they would get. 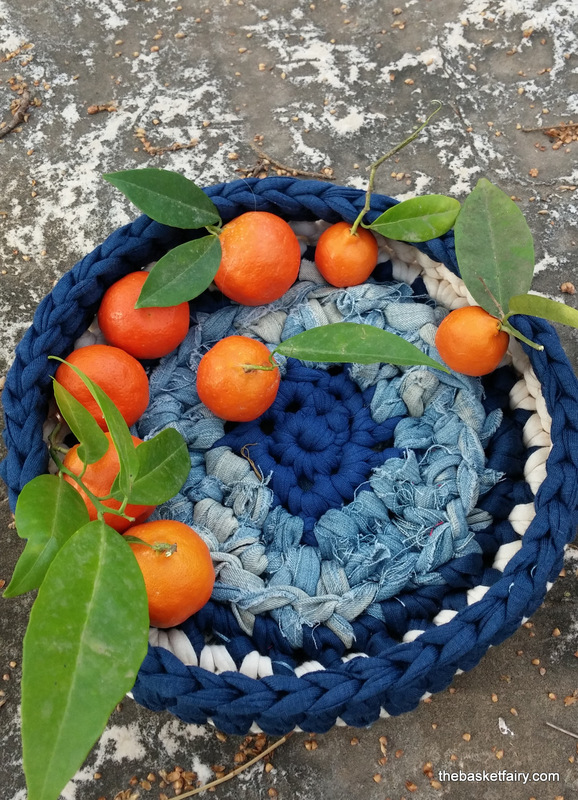 Faith, patience, persistence… If we were lacking in them, the tangerines were not. Patience and persistence is what that old pair of jeans had, too. To wait around, faded and torn, for years – decades! 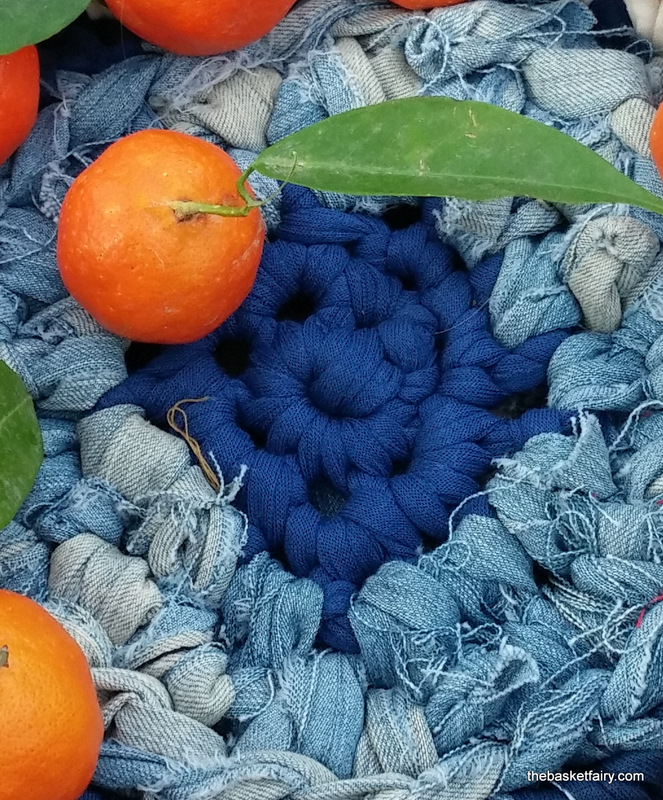 Till that moment of grace arrived and their fabric was turned into a useful and pretty denim basket. 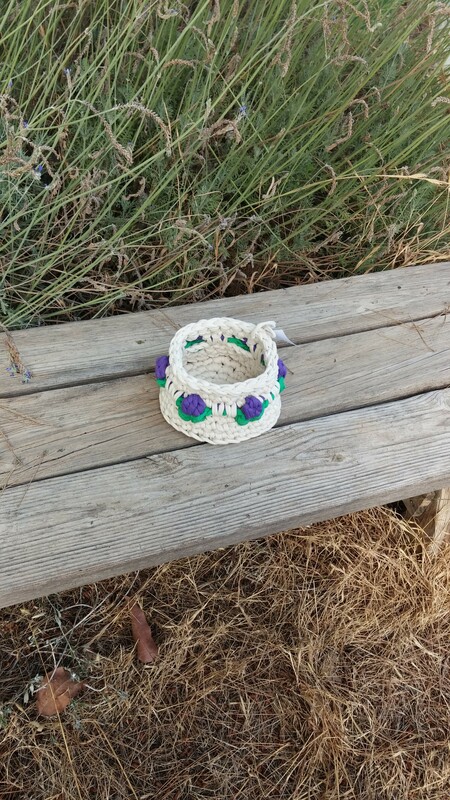 I know it looks kind of shabby-chic (well, I’m hoping…), very raggedy and crochet-what-may-come – right? 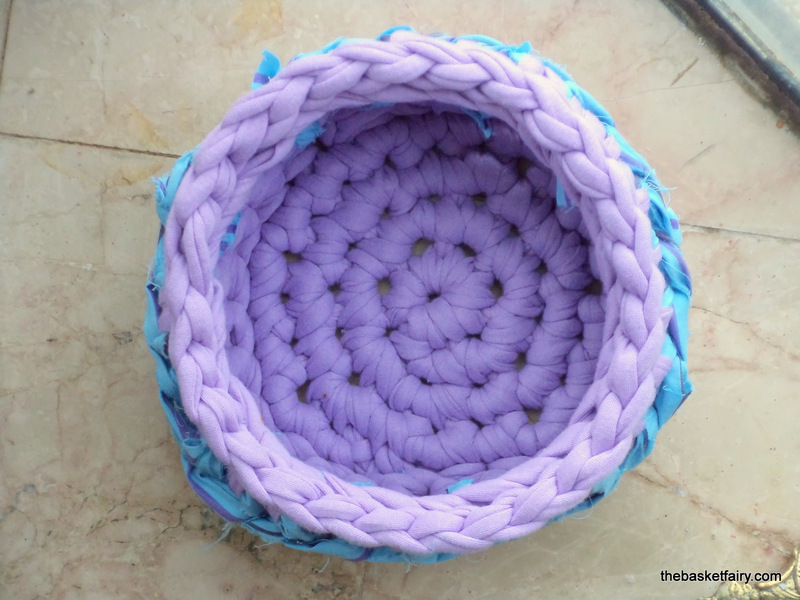 Well, will you believe me if I tell you I crocheted, un-crocheted and re-crocheted parts of this basket as many as ten – fifteen – okay, twenty times? (Did someone mention patience and persistence?). 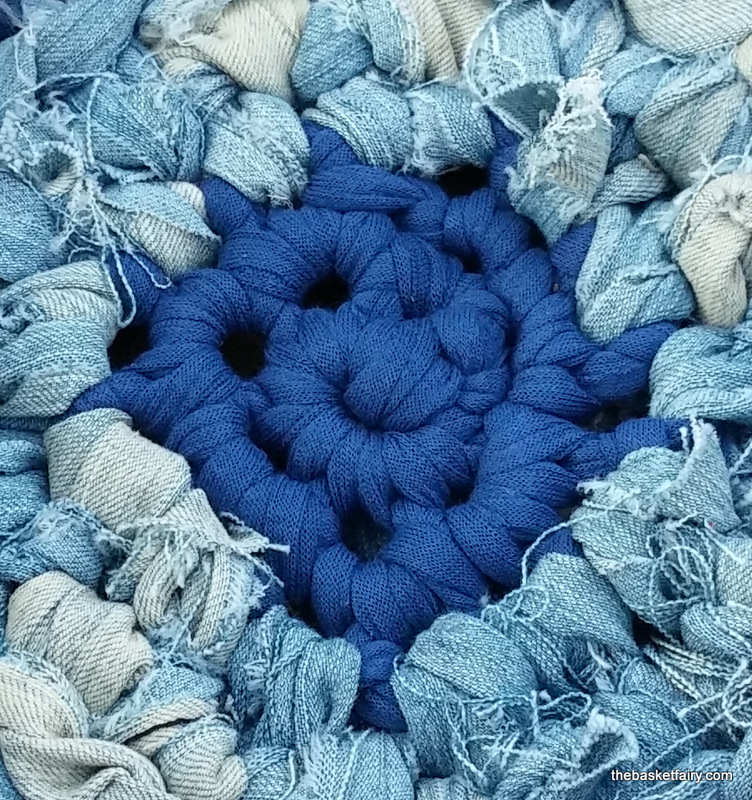 See, it is exactly when something is “natural”, “coincidental”, that you can get to the point where – it’s not quite right, and the difference between messy – vs. cool – can be a stitch here and not there, that perfect shade of blue, and two, not three rows in height. 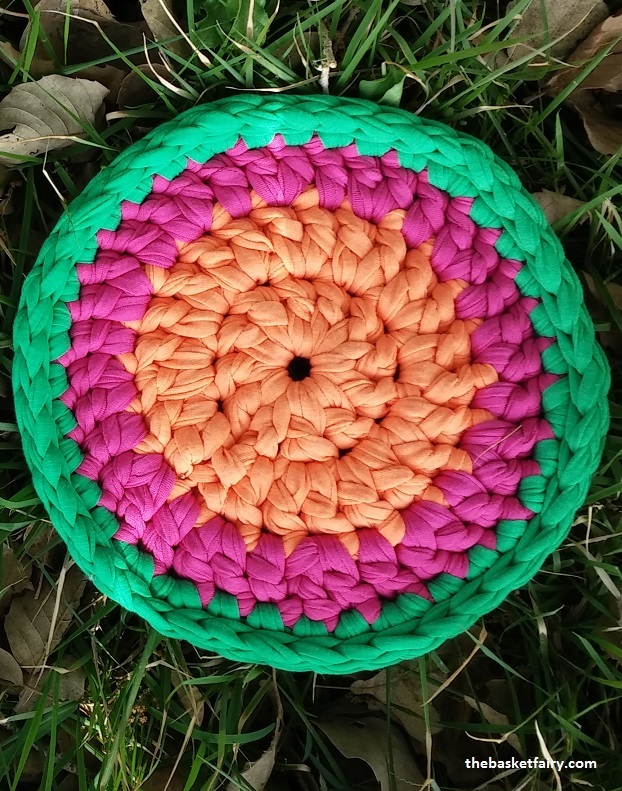 In the end, I like the outcome – it just took me some time to realize This Was It. 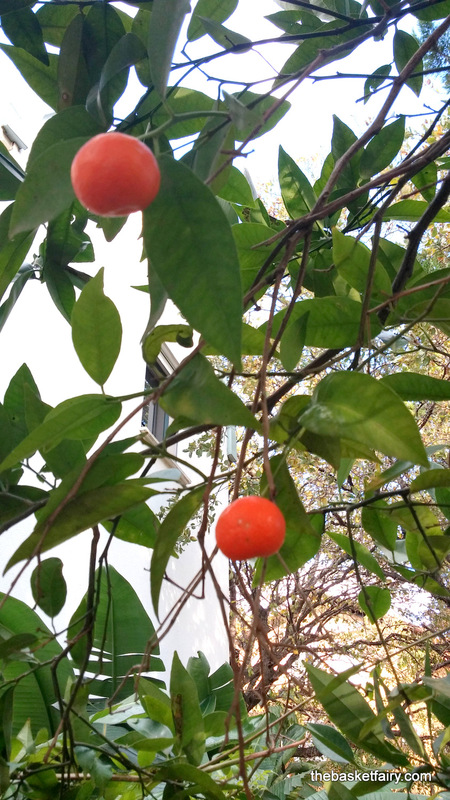 A good thing all that time, the tangerines were busy ripening on the tree. Have some, please – or you’ll have to wait till next year! 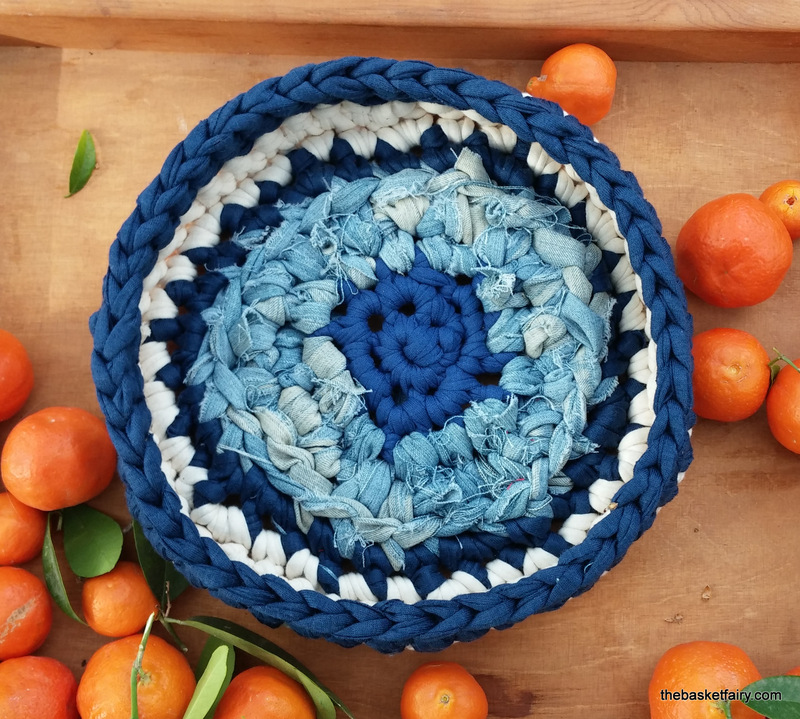 This entry was posted in Projects and tagged basket, crochet, crocheted basket, crocheted bowl, denim, fabric basket, fabric bowl, fabric yarn, rag crochet, recycling, recycling clothes, recycling jeans, t-shirt yarn, tarn, textile yarn, trapillo, upcycling, סלסלה מטריקו, סריגה בטריקו on March 9, 2016 by The Basket Fairy. 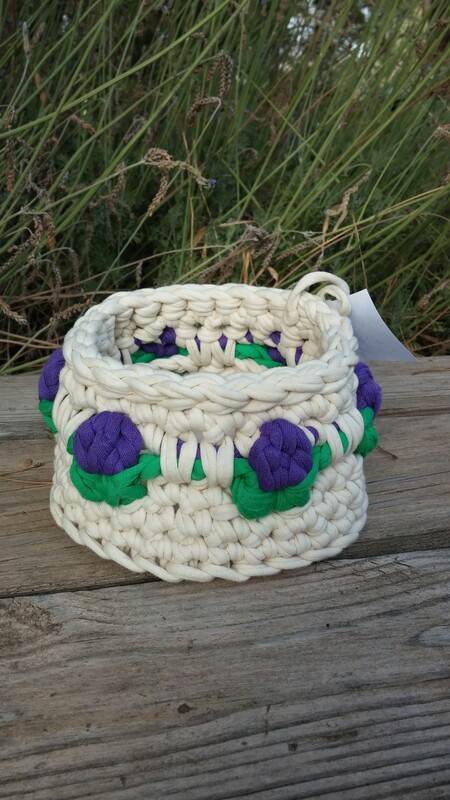 Remember Louis , the neighbors’ cat for whom I made a cozy basket? 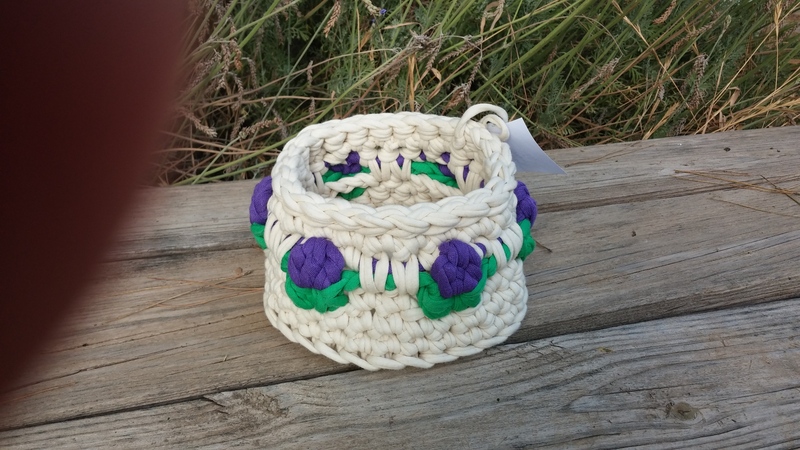 All summer, Louis spent most of his time outside, and so I waited with great anticipation a certain interest to see whether the basket would do its job of keeping Louis warm and snug. I was flipping overjoyed delighted! 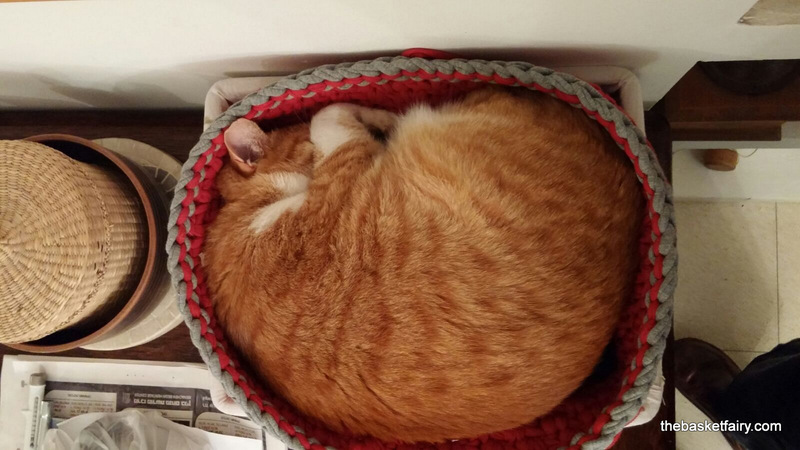 Louis is actually using his basket, and he looks as pleased and snug as… Well, a cat in a basket! And take a look at this one – one can only imagine what sweet dreams he must be having (about the summer, when he was chasing toads?). 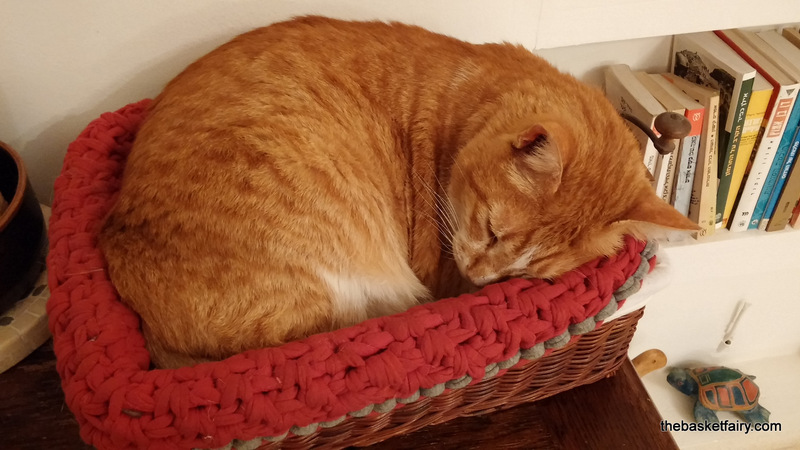 Louis’s new basket is perched on the exact same newspaper basket that he was using to snooze in before he received my gift. 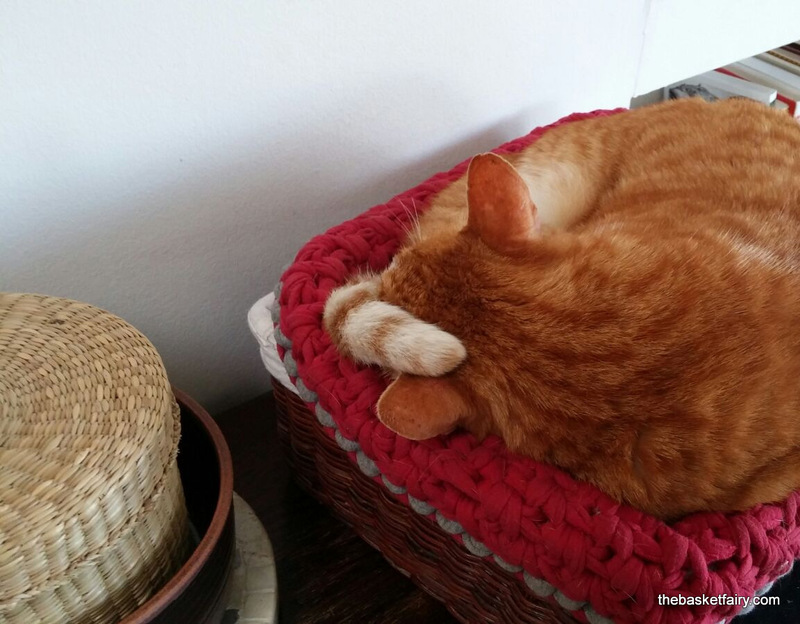 Rather than give it up, and finally allow his people access to their newspapers, Louis apparently decided that two baskets are better than one. Like many a cat, he has a certain regal inclination to assume he will meet little resistance on such matters from his people, which of course proved true in this case. Which brings me to another Louis, one much closer to kings and thrones and such, but let me tell you the story as it actually happened or you will not believe me! 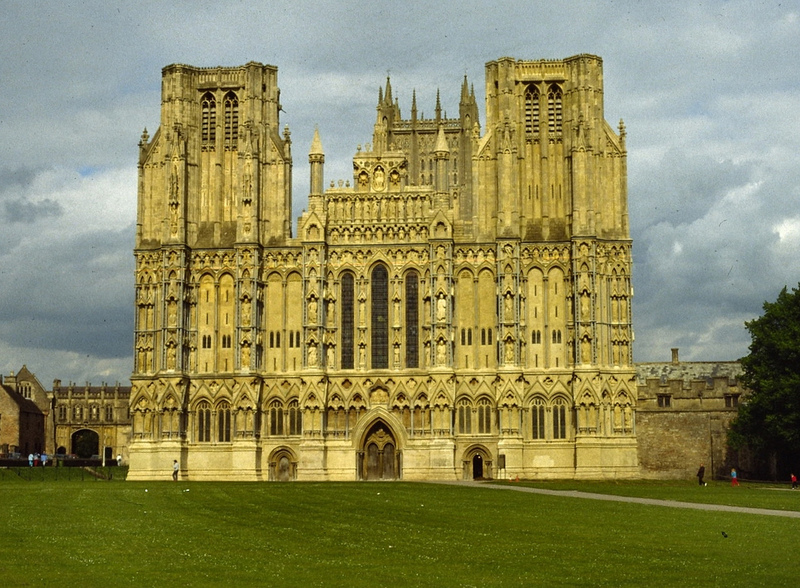 Soon after posting about the basket I made for Louis, I was googling the title – but typing in “A Basket for Louis” brought me to another Louis, in another basket, in another place – and not just any old place – but the splendid and ancient Wells Cathedral in England! 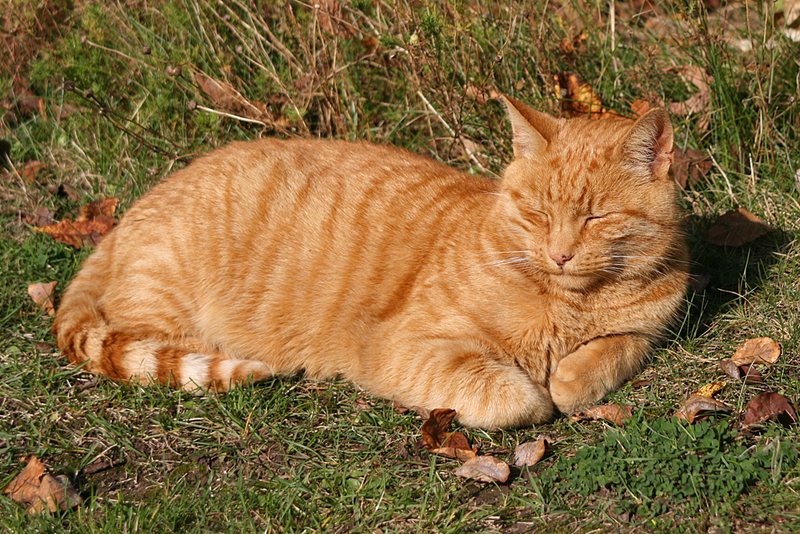 I quickly read on to see who this famous feline was – and lo and behold, it turns out the Wells Cathedral Lewis is a ginger tom-cat just like our next-door Louis! I was speechless… Our neighbors’ cat has a world-famous doppelganger! 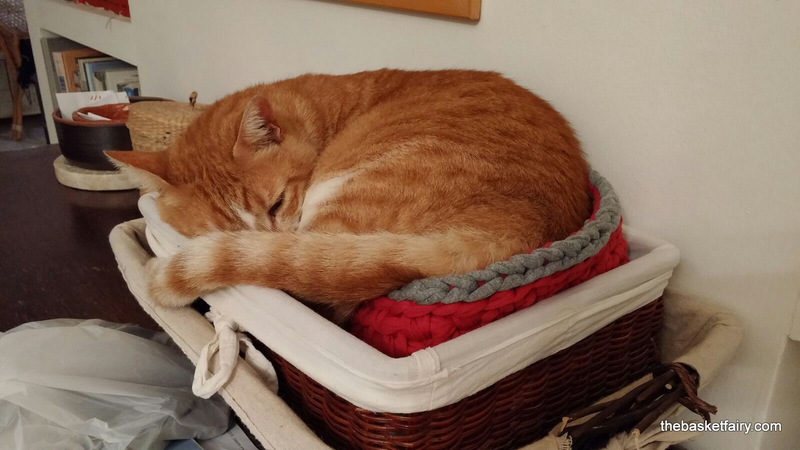 So famous, he’s even had a little film made about him… Louis of the Cathedral is so eerily like next-door Louis – in his appearance, in his tom-ish nature, and in his love of snuggling in cozy baskets. Like our next-door Louis, Cathedral Louis reigns from his basket over the abode that he resides in, certain that he is the true regal ruler of the premises. I read the stories about Louis the Cathedral cat with fascination, looking for a possible explanation to this uncanny coincidence. Twins separated at birth? Some cat-magician casting a spell? You may think there is a logical explanation, such as – our neighbors having heard of the Cathedral Louis when they named their cat – but I assure you that this is not the case! You see, Louis was a lost kitten when our neighbors took him in. The name Louis was chosen by a little girl who didn’t speak a word of English at the time, in a country very far from England and its cathedrals. I have no idea where she’d even heard the name, but it must have sounded exotic to her. And so the mystery remains. Perhaps ginger tom cats with regal inclinations and a love of cozy baskets simply inspire the name Louis in their people? For while the Cathedral Louis is very princely, you can see by now that our neighbors’ Louis is far from a pauper. He spends his winter days snuggling and snoozing in what is definitely the best spot in the house, close enough to the wood stove, with a good view of the front door, in full control of everything and everyone. In summer, he reigns over the great outdoors, coming and going as he pleases. As cats are not big travelers, I doubt these two will ever meet. It is also quite unlikely, given the geographical distance between them, that they were ever exchanged. But I hope they both continue to enjoy their different – and yet somewhat similar – lives, snug, happy and purring with royal content. 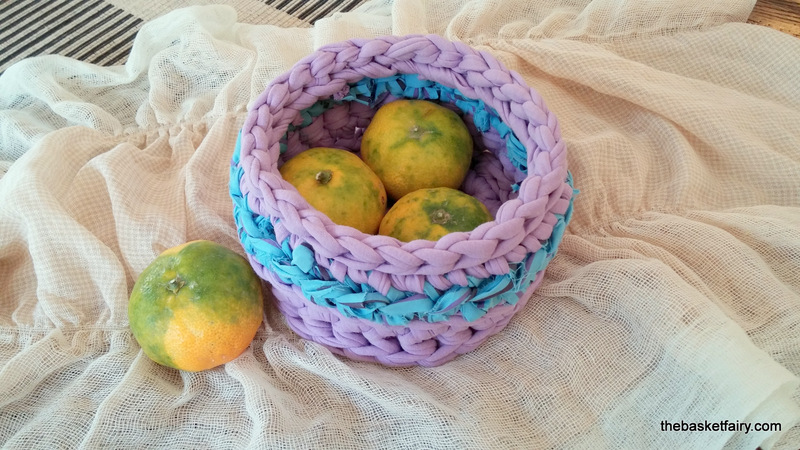 This entry was posted in Projects and tagged basket, cat bed, crochet, crocheted, crocheted basket, crocheting with, fabric yarn, rag crochet, t-shirt yarn, tarn, textile yarn, trapillo, woven stitch, סלסלה מטריקו, סריגה בטריקו on January 31, 2016 by The Basket Fairy. Walking home from the bus stop I passed by the clothing recycling bin. 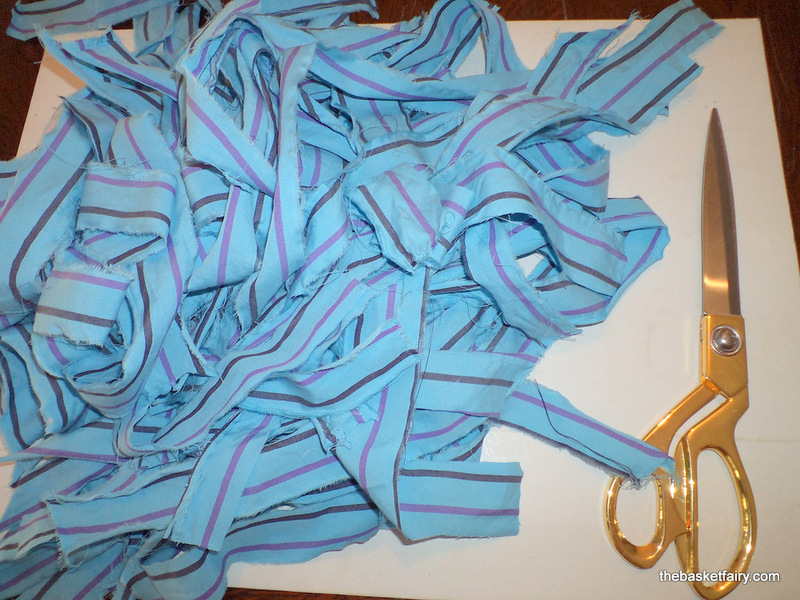 Next to the bin was a plastic bag with some children’s clothes, and on the top was a boys’ dress shirt in turquoise with purple-pink stripes. How could anyone think of turning that into clothing pulp, or – as rumor has it – cloth wipes for the car wash industry? Mercy knows no boundaries, and so I picked up the shirt and took it upon myself to deliver it to the second hand shop, whose earnings all go to scholarships for disadvantaged girls. Which is how it landed upon my good deed roster to also launder it. It was only when I took the clean shirt down from the clothing line that I noticed it: An amoeba shaped fade-stain on the front right next to the second button from the bottom. 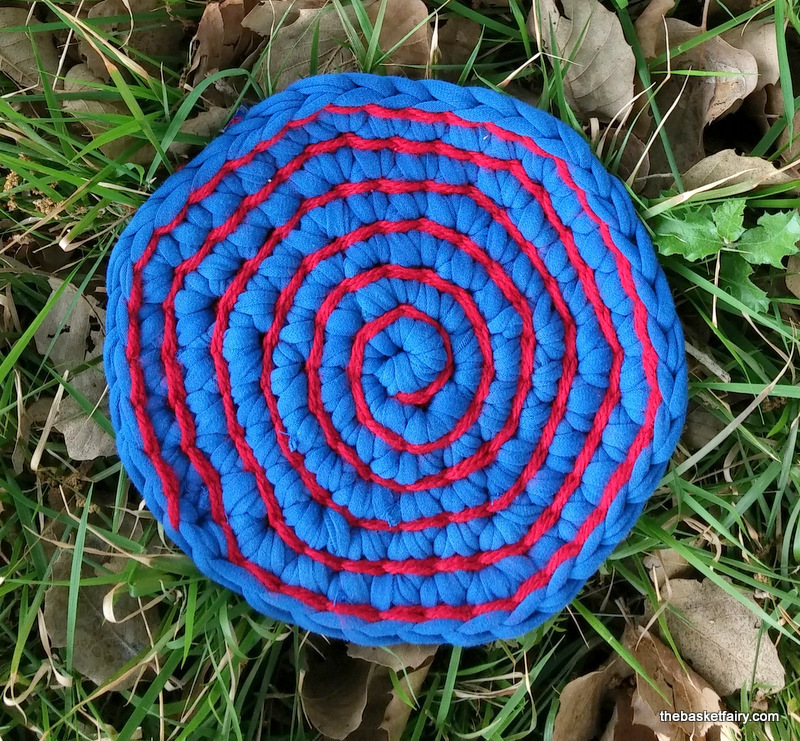 By now, however, there was no turning back: Our destinies were intertwined, and knew I had to do what I had to do – tear the shirt up into strips and crochet it. 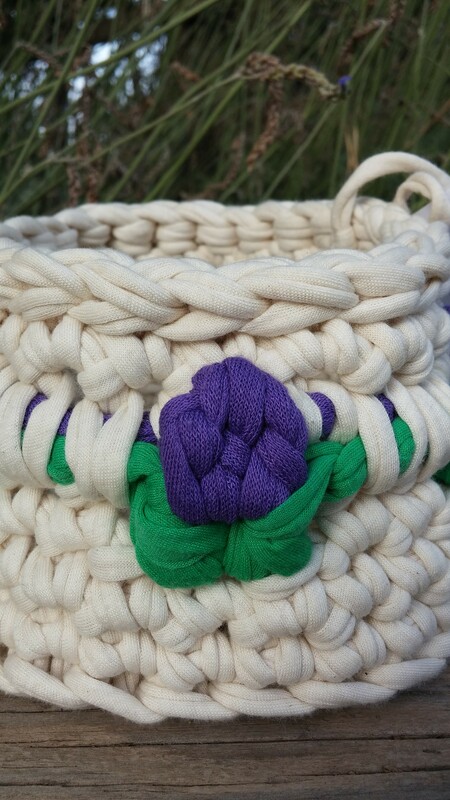 Whether bounty or burden, I could not deny the delight of hooking this delicious color as a trim for a small basket. 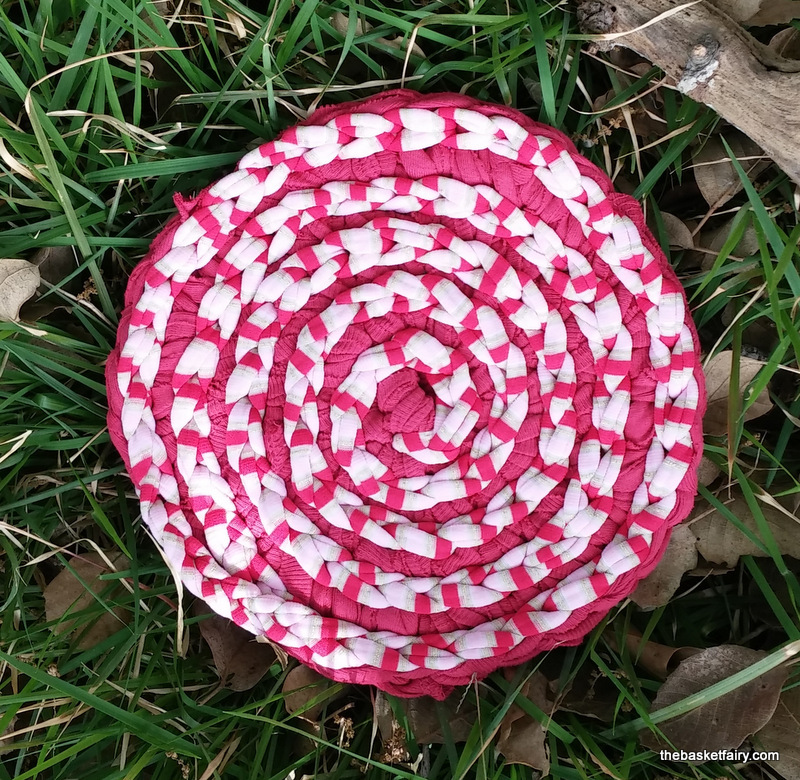 I used an equally delicious pale magenta strand to make a soft but sturdy basket that I have not yet decided how to use. 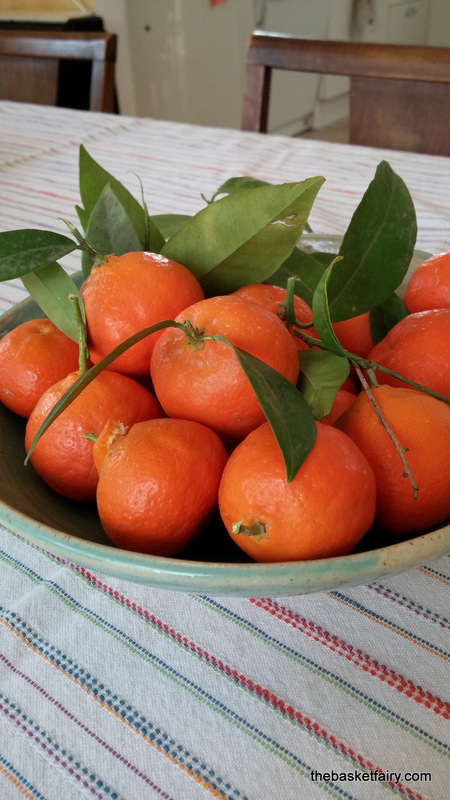 In the meantime, it is posing here with some hand-picked tangerines, a gift from our dinner guests, or rather, from their tree. Is there anything fresher or sweeter? 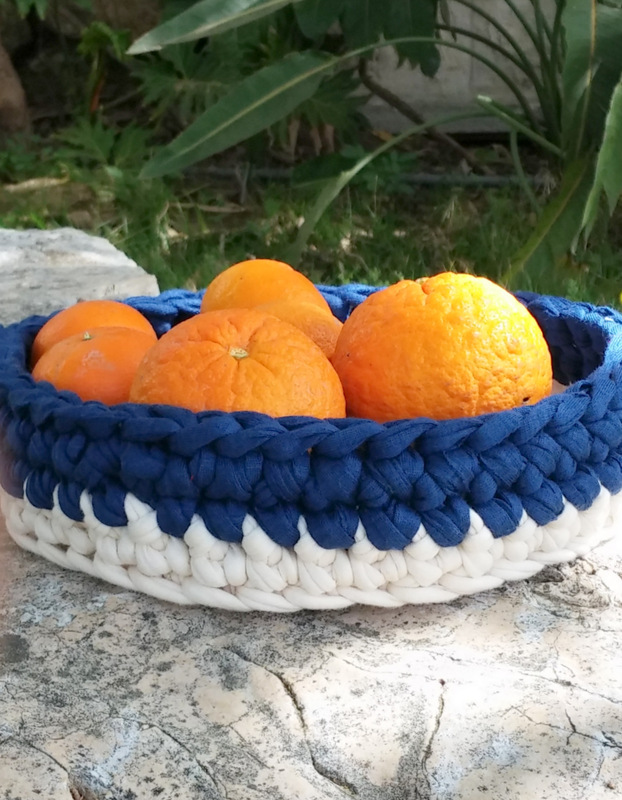 This entry was posted in Projects and tagged basket, crochet, crocheted basket, crocheted bowl, DIY, fabric basket, fabric bowl, fabric yarn, rag, rag crochet, rags, recycling, recycling clothes, t-shirt yarn, tangerines, tarn, textile yarn, trapillo, upcycling, סלסלה מטריקו, סריגה בטריקו on November 17, 2015 by The Basket Fairy. A quick trip to the fabric yarn shop, and back I was with two bags of everything bright and pretty. 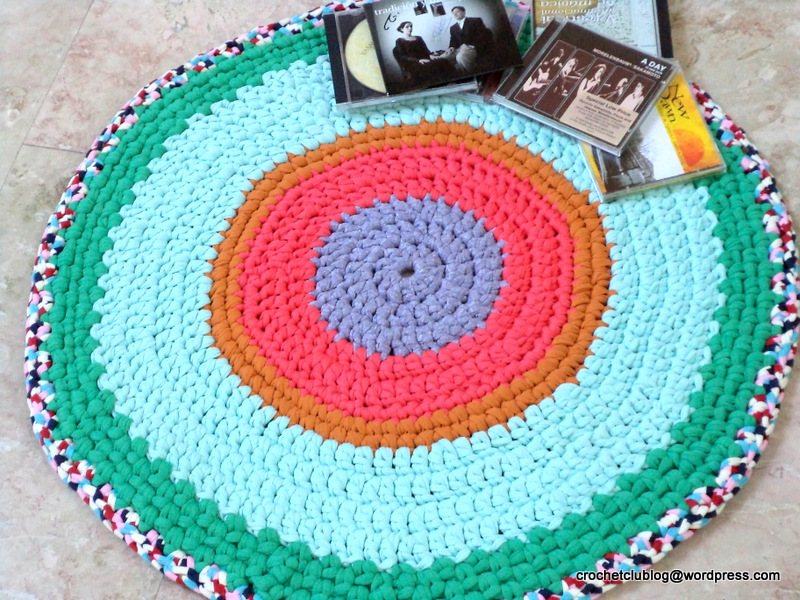 The choices were made by the recipient of the rug (the colors and their placement – I’m not sure I would have been as bold! 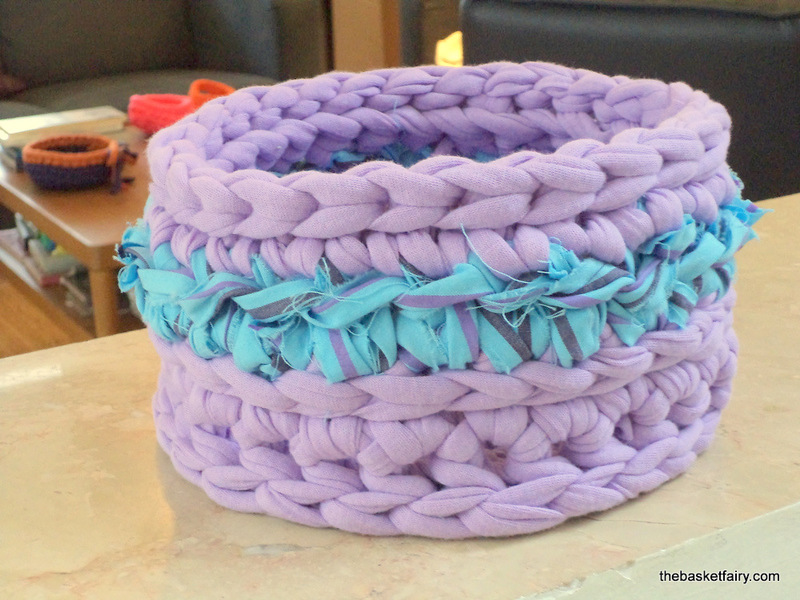 ), whereupon stitching was begun… And not stopped until I had this! It reminds me of a bright sun in a circular sky, and so the title, but I admit it also has to do with the recipient. 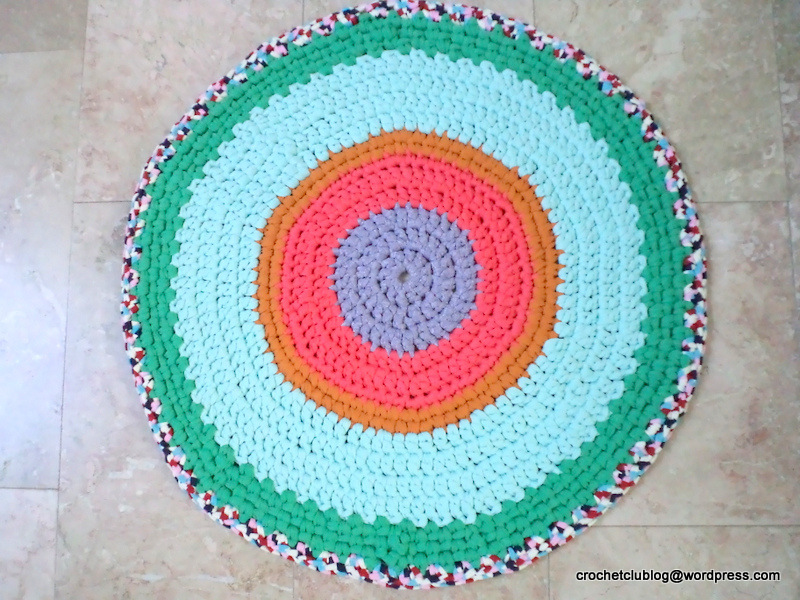 I used a size 12 crochet hook and medium-width, medium-stretchy fabric yarn. 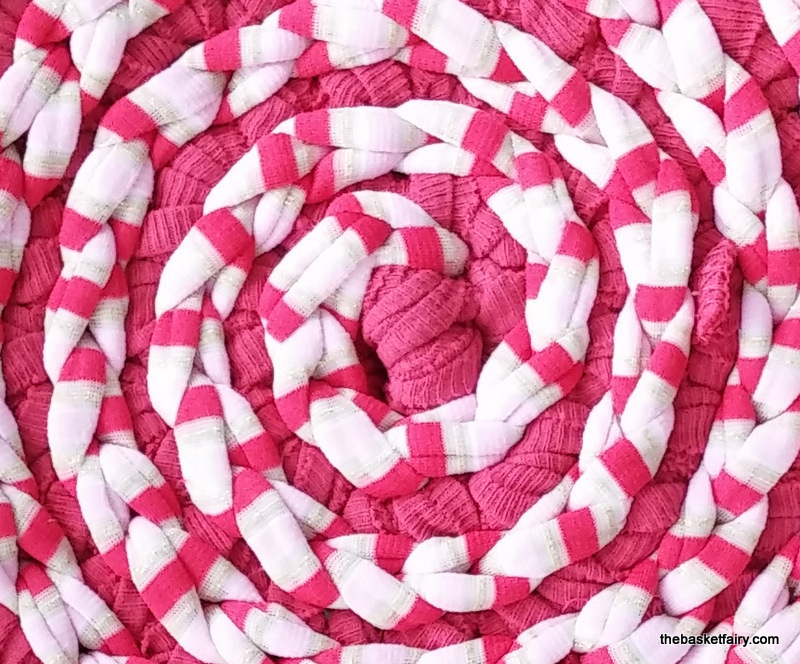 I started with a magic ring, stitching 12 dc into it, and ending the row with a sl st into the first dc. To start a new row, ch 3 (or ch 1 if you’re starting a row of sc). To start a new strand/color in a new row, sl st into previous row, and chain the number of stitches needed (ch 3 for a row of dc or ch 1 for a row of sc). I used dc or sc alternately, depending on the texture of the strand – for softer or thinner strands, I used dc. For less flexible or thicker strands, I used sc. Another consideration was the color pattern – for example, rows 4-5, the orange, were done in dc, but for row 6, I used sc, because another row of dc would have made the orange circle too large for the composition. How did I know this? Because I tried it, of course! This is my favorite designing method – make, undo, remake until you’re happy with the result. Of course, a row of sc takes up less thread too, so when you’re nearing the end of the strand, this may be a consideration (not so in this particular case). The increases are made as usual – 12 increases for rows of dc, 6 increases for rows of sc. 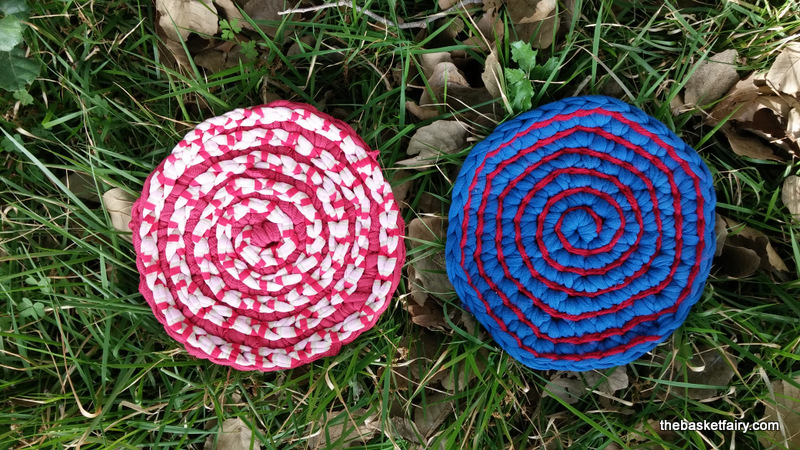 When I reached the green strip, I switched to woven stitch (here is my explanation on woven stitch). But you can continue on with sc. 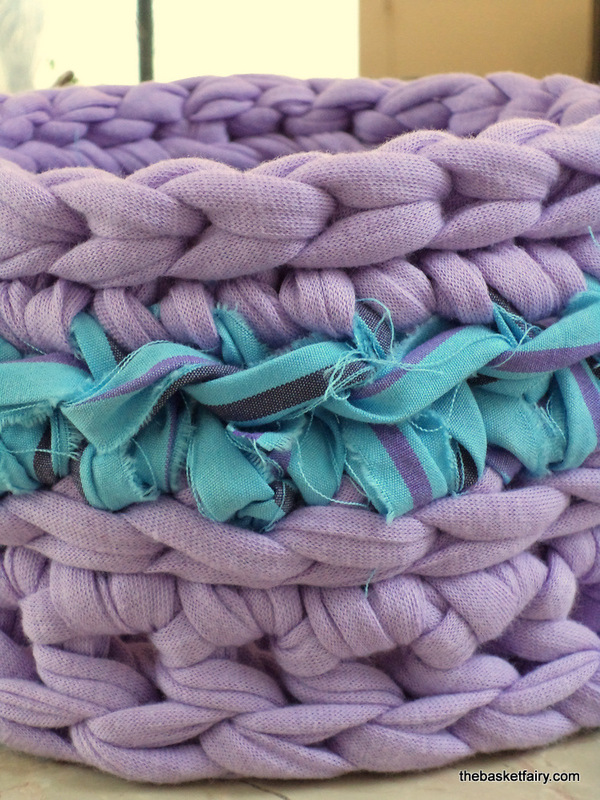 The main reason I used woven stitch here is because my green strand was thicker than the blue of the previous row, and I thought the woven stitch would be less bulky. 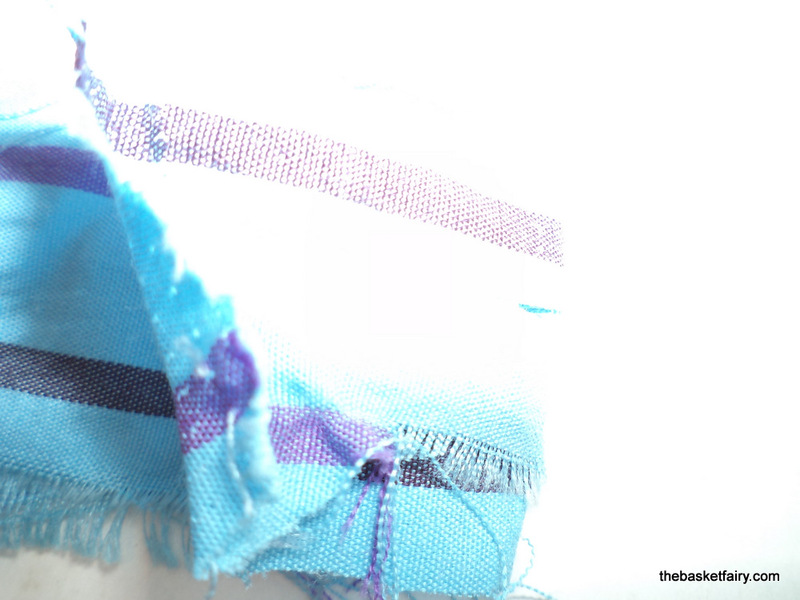 Accommodating stitches to the strand type is one way to integrate different types and widths of strands in the same project. 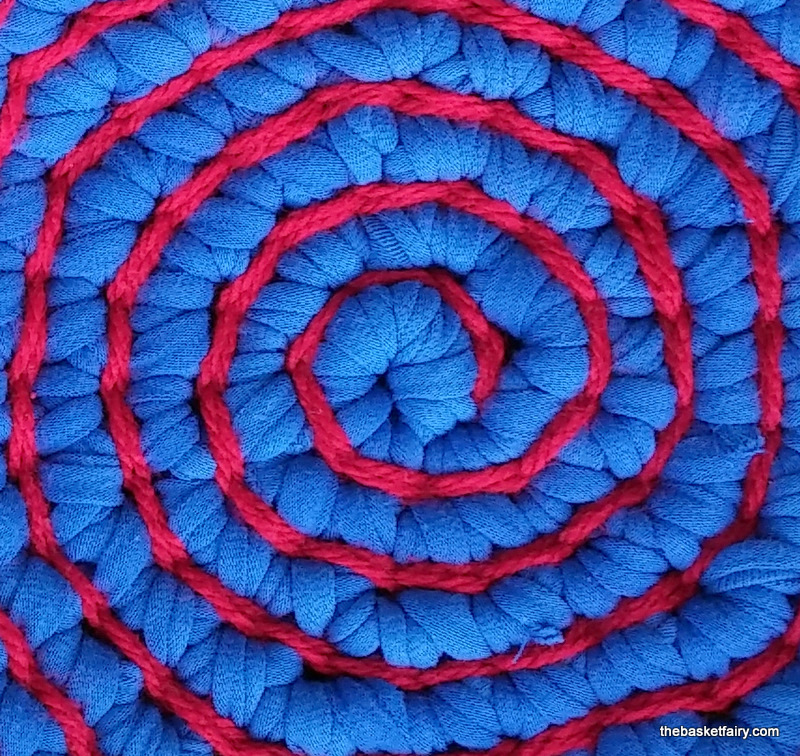 But whatever stitch you are using, it’s important to remember that if you have a thicker strand, you may need less increases in the first row of that strand, and if you have a thinner strand, you may need more increases in the first row of that strand. 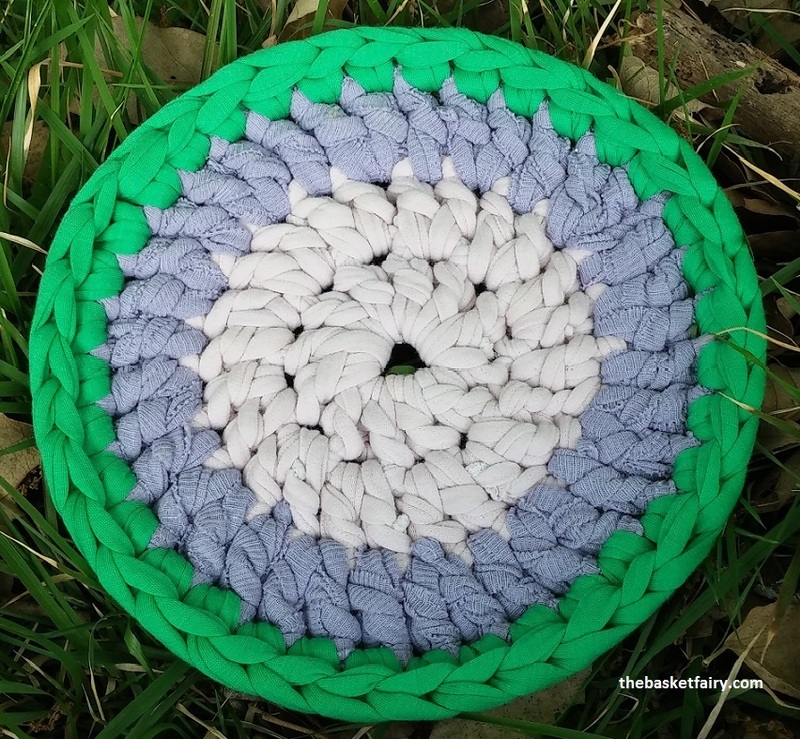 So there is always the formula for increases, but you have to look at the outcome and see if your rug is lying nice and flat. Generally: Flat is good, wavy means you have too many increases, and bowl-shaped means you don’t have enough increases. The final crazy-colored row was done in 2 sc into each space of the previous row (space = below ch st). Increases for this row, when needed, were done with 1 ch st between 2 pairs of sc. 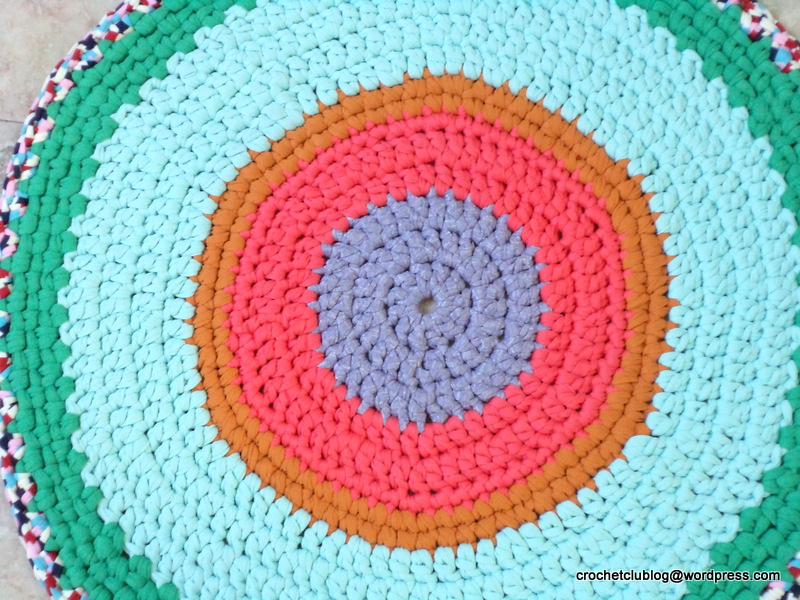 This entry was posted in Projects and tagged crochet, crochet rug, DIY, fabric yarn, t-shirt yarn, tarn, textile yarn, trapillo, woven stitch, Zpagetti, סריגה בטריקו, שטיחון on October 9, 2015 by The Basket Fairy.